Just thought I'd throw that out there. I'm not sure whether I've told you or not, but I adore scones. 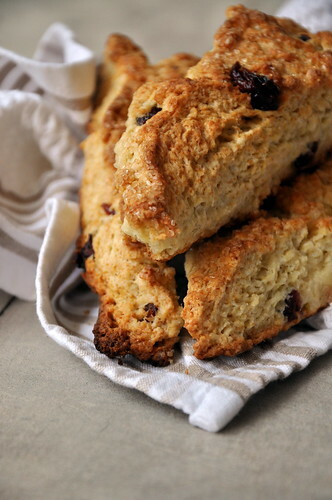 I think I can honestly say that scones are my absolute favorite baked good. Ever. They have a little undertone of sweetness, but they are not so overly sugary that you wouldn't want to smear a delicious dollop of jam or lemon curd on top. No, no, no. 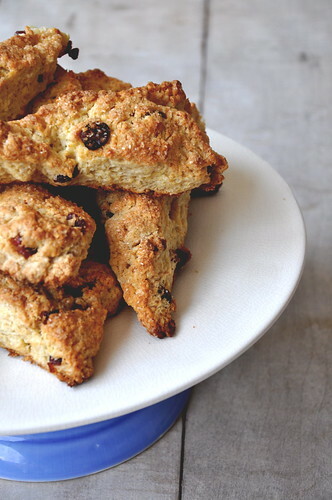 Scones are perfect in every way. That is, of course, when they are made properly. So many American scones are saccharine rocks that overwhelm you and make you want to scrub your mouth out with a lemon peel. These little beauties do not fall into that category. We have been making biscuits non-stop lately at work. Cornmeal cheddar biscuits, sweet potato biscuits, heavy cream biscuits. We've done just about everything under the sun that there is to do with biscuits. I was never a big fan of biscuits. I always found them heavy, greasy, and flavor-less. They just didn't do anything for me. I still wouldn't run to a biscuit, stuff it in my mouth, and pop another one in right after, but I do have a new-found respect for them. What I have learned is a wonderful technique for making light, fluffy biscuits. I decided to put this knowledge to use in a recipe that was more up my alley. Instead of using a pastry cutter to incorporate the butter into the dry ingredients, I used my fingers, snapping them on the chunks of butter until they were in pea-sized lumps. I also swirled my hand through the dry ingredients while I poured the buttermilk in to help keep the scones from being dense. 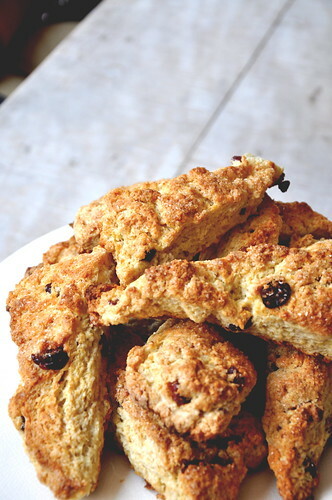 I've made these scones before with great success; however, my new style of scone making worked even better! Preheat oven to 400 degrees. Whisk the flour, baking powder, baking soda, sugar, and salt together in a large bowl. Scatter cubes of butter over ingredients. Combine butter and dry ingredients using your fingers in a snapping motion or with a pastry cutter until the butter is in pea-sized lumps. Make a well in the center of the dough. Pour the buttermilk into the well and sprinkle the zest in. Sweep your hand in an s-shaped motion through the dough until it is combined, but be careful not to over-mix. Alternatively, you could mix the dry ingredients and butter in a stand mixer until the desired texture is achieved, add the buttermilk and zest, and let the mixer run until the dough is combined. Fold in dried cranberries Turn dough out onto lightly floured surface and pat out until it is about 1-inch thick and 5-by-18-inches. Cut dough into 12 triangles, brush each with melted butter, and sprinkle with Turbinado sugar. 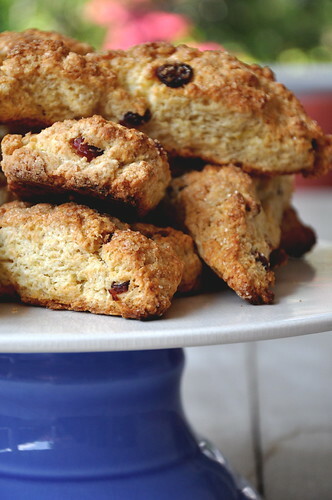 Transfer scones to a baking sheet lined with parchment paper. 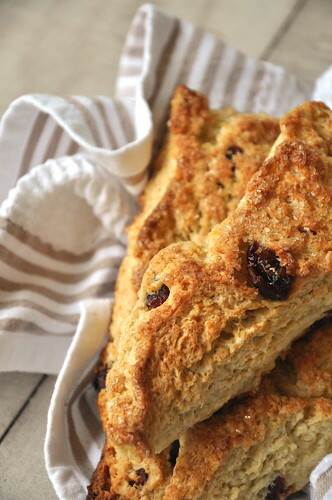 Bake for 25 minutes or until the scones are golden brown and firm to the touch. Remove from oven and serve warm or rest on a wire rack to cool. P.S. In case you couldn't tell, fall has been on my mind lately. I cannot wait to get to Northwestern, see the turning leaves of autumn, and get out of this heat!